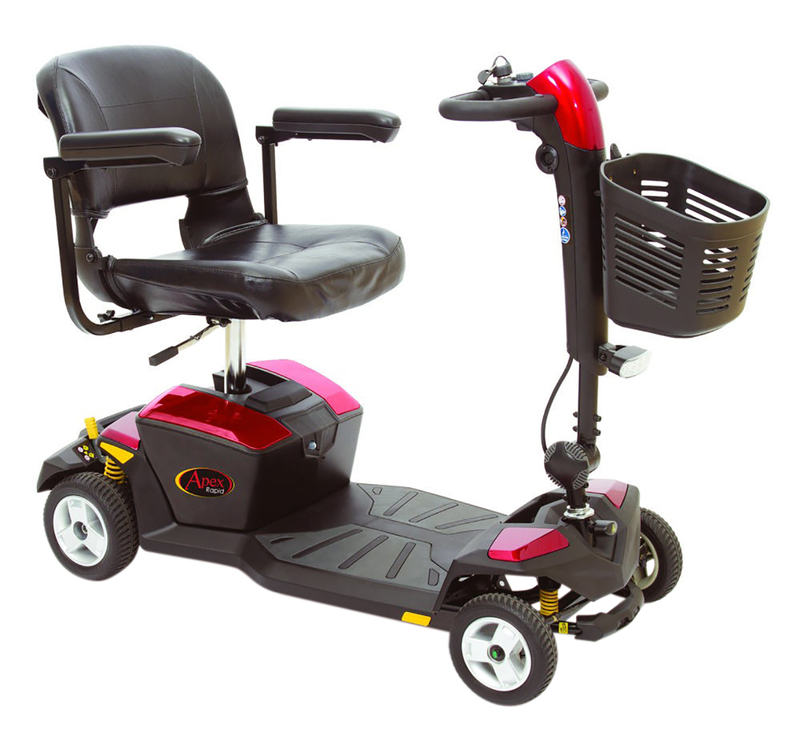 This travel scooter features all-round Comfort-Trac Suspension for a smooth ride quality. The delta tiller control system is easy to use. Optional shrouds are available in four different colours. Price excluding VAT.(Incl. VAT £1,194) *VAT Relief available on this product. The Apex Rapid is extremely lightweight and portable. It can be disassembled quickly and easily, ready for your car boot or small storage space. The heaviest component weighs just 16.6 kg. It can be broken down into 5 pieces using only one hand. The main feature on this scooter is the advanced Comfort-Trac Suspension on both the front and rear axles. This helps to absorb all the little bumps on the surface, giving you a smoother ride. Charging the Apex Rapid couldn’t be easier. The 17 Ah batteries can be charged on or off board. That way, you can store the scooter in a shed or garage while charging it in the comfort of your home. A comfortable rotating seat gives the user easy access when getting on and off. It also offers a large weight capacity of 21.4 stone which means it would be suitable for most people. Other features include delta style handlebars and an adjustable tiller, LED kerb light, and a front basket to store items. The sleek and stylish look combined with exceptional features make the Pride Apex Rapid a great travel mobility choice. If you’d like to discuss the Pride Apex Rapid in more detail, please call our team on 02392 255600 where we’d be more than happy to help.